I remember back in the early part of the primaries when Barack’s blackness was questioned, Lady Michelle Obama was the trump card. Beyond the shadow of a doubt, Michelle is black. She’s so black she’s bringing her mother to live in the White House with them. Black Americans haven’t experienced often black women who are exalted in the media’s eye. Over the years we’ve had to celebrate the “mothers” of our community by ourselves. By in large, I could run a list of black women that are household names such as Sojourner Truth, Harriet Tubman, Jarena Lee, Madame C. J. Walker, Marion Anderson, Rosa Parks, Shirley Chisolm, Barbara Jordan, Fannie Lou Hamer, Maya Angelou, Oprah Winfrey, Cicely Tyson. Absent from that list is the matriarch of the bunch Coretta Scott King. I want to use Coretta as a point of departure to view Michelle Obama. In my humble opinion, we’ve only had three matriarchs that have risen above the rest in the black community. The reason that Coretta makes this list first is because she was married to Martin. Truth be told, I doubt we would have ever had heard of Coretta Scott King if she wasn’t married to Martin. That said, many of the black women that have been lifted in the American spot light were women who were by all accounts single. Oprah Winfrey, and her then Steadman most certainly didn’t constitute a power couple, even if the wife was on the top. From the aforementioned list, none of us know about their husbands, if they were married in the first place. As a result, we have produced this stereotypical black woman who operates without a man. That’s not the end of the world by any stretch. These single black women are more than capable of being productive members of society; we as human beings are adaptable like that. However, there is something to be said about nuclear families. The King family, despite Martin’s predilection for white women, personified the archetypical family. Through the seventies and the early part of the eighties with such few time since the assasination of MLK, no major black family emerged. Then came The Cosby Show. Even though Good Times showed a nuclear and functioning black family, one could still say that the buffoonery that was JJ pushed John Amos to leave the show ultimately knocked out whatever minimal chance of them being seen as a real black family. However, Claire Huxtable personified so much of what it meant to be a strong black woman that many people in our circles speak of her as a real person; as though Claire was some wife and mother in a reality show of the present. I know some people love to criticize The Cosby Show and say that it is not indicative of real life, and what mother could work 9-5 and still take care of the house. Well, I ask the question, what sit-com is really true to form as life really happens? The Huxtables, as did the Kings portrayed the archetypical black family. Moreover, we saw the progression from the Kings to the Huxtables with a black woman who just protected the homefront, so to speak, to a black woman who was able to work and protected the homefront as well. What made the Huxtable’s wonderful was that Cliff supported his wife 100% and actually relished in her intelligence. I’ve heard some say that this was really an emasculation of the man and the male qualities that Cliff deferred to Claire so quickly. I think it’s a bad interpretation to see masculinity as that which is at times deferential to femininity. If nothing else, it shows a strong relationship between the two. Claire didn’t look at her husband as less than a man because of it. And then we have The Obamas. As for me personally, I’ve never experienced such a black power couple. We may attach power couple status to the milquetoast blackness that is Will and Jada Smith, but let the record show, there is nothing inherently blackness in their actions. By in large, these two don’t fit the mold seeing as how they are swingers. Although, their “Divorce is not an option” isn’t a bad premise, but still it almost stands in opposition to their open marriage, but I guess that’s a post for another day. For what it is, Michelle to me is an epitome of what it means to be a black woman and have it all. She’s almost the real life version of Claire Huxtable. We’re still waiting for the most part to see how Michelle defines the role of the First Lady for herself. Parenthetically speaking however, whatever authentic Michelle is, I hope she feels free to do so. I think she should feel free to serve macaroni and cheese, collard greens, candied yams and cornbread dressing for a state dinner if that’s what she normally eats. Seriously, would we really expect someone from our State department to go over to Japan or China and serve steak and potatoes and not a traditional dish? I don’t see the difference when it comes to this administration. One faithful blogger I read in a comment on another blog wrote that Michelle (and by extension Barack) should be professional and that cornrows in Michelle isn’t professional and some others quipped that soul food served at a state dinner is inappropriate. I raised the unanswered question of who determines what is appropriate essentially. Why is our type of food considered inappropriate even by those of our color; and why is is our hairstyle, something that is inherently ours and a true African retention that we took with us from the shores of Africa to this new world. Honestly, given Michelle’s treatment in the media which really hasn’t had to deal with any strong black women aside from Oprah, and as I’ve already noted Steadman is a non-entity. The public seems to finally have leveled out, but given the New Yorker cover from this summer and that New York “art” exhibit, it may be a long road ahead. I could imagine the blogs, both black and white, conservative and liberal going awry if soul food gets served in the White House. It always amazes me how white American culture co-opts that which was inherently African American. Now it’s not uncommon to see a white girl with cornrows. It most certainly isn’t uncommon to see white folk “slummin'” at places like Busy Bee’s or Miss Anne’s out here in Atlanta, but they’d be the same one’s saying it’s inappropriate to serve it at the White House or in certain occasions. I’d turn and question what is appropriate–anything that isn’t uniquely African American? But are not just as American as the rest of the Europeans here? I guess we all have amnesia that most of us in this country aren’t indigenous to this continent. I didn’t mean to say all of that, but I’m glad I did. We’re all fascinated with her. She’s a novelty. As I’ve pointed out, she’s living in a rarefied space that she should feel free to define for herself as she see’s fit and not be defined or spoken for by others. Given her statement that “for the first time I’m proud of my country” we all know that’s she’s not one to mince words. Let us remember that the immortal words of Thomas Jefferson that “we hold these truths to be self-evident that all men [persons] are created equal” wasn’t ratified until November 4th, 2008. How do you feel about our about to be new First Lady? Why do some people have a problem serving soul food to Nicolas Sarkozy if he were to drop by the White House–is it really that serious? Should Michelle feel free to wear cornrows if she wanted to? Is this even an issue–should she be excused because she’s First Lady? I really like Michelle Obama. I like the fact that she’s a strong, opinionated, intelligent, educated , whitty, loving and devoted mother black woman. She seems REAL. Not someone who thinks she’s high and mighty. She seems like she’s one of the girls that you can just kick it with. I want to say that we as black people still play into the stereotype that we’re all the same because we’re black. We were all kind of raised the same way and so on. We have to be real with ourselves and acknowledge that we’ve been raised in the hood, the country, small towns, suburbs, big cities and that that’s okay, instead of criticizing each other for it feeling that if you don’t live one way, you’re not black enough or ghetto. Look, even before we’re brought over on the boats we all came from different tribes/people who has different ways off doing things. I know the comments in the blog that you’re referring too and I didn’t see the big deal either. If the hair is long enough cornrows pulled back into a bun is actually quite nice and professional looking. Soul food is food just like anything else. The only thing that makes it look laid back is when we put it in those huge foil pans for barbecue’s and other events and I think that’s what we seem to associate it with along with the Styrofoam. Put all that stuff in some nice stainless steal, good silver catering dishes and no one would know the difference. Do other countries discuss what food is appropriate? Why shouldn’t we be open to having others try the different foods that different areas of the country. I feel if we can go over to their countries and eat sushi (raw fish, which I’ve had a craving for some weeks), escargot (snails) and whatever we may be served, they can have some sweet potato pie and greens. They could possibly even enjoy it (but let’s be real not everyone can cook greens so we need someone who can put their foot in it). I think as long as we aren’t talking serving Mickey D’s, its perfectly fine. Although it might be funny to see dignitaries/prominent world leaders sitting around tables in tuxes and ballgowns eating a large fry and Big Mac. Winnie Madikiezela-Mandela and Betty Shabazz could be added to the list of more contemporary ‘women of substance .’ Both women are known, of course, because of the absence of their husbands. I’m sure that there are more. You bring up interesting observations. 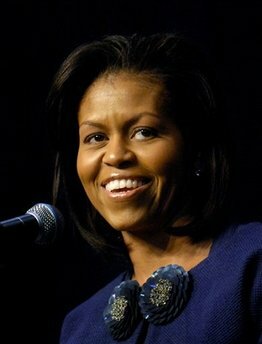 First Lady Michelle Obama is in a unique position to redefine our perception of that position. I appreciate that Michelle has tentatively defined her role as ‘first mom.’ I trust that putting the children first becomes a mantra for those mothers (single and/or married) who may be encouraged to prioritize the nurturing despite working outside the home and having career aspirations. For those women who can choose to stay home and/or work part-time, Michelle’s role as ‘first mother’ may validate their decisions to ‘mother first’ while also fulfilling other active roles in community building through volunteer efforts. I luv Michelle Obama. I simply do. She has made choices for herself all the way along. She’s not a victim. She’s not some passive person. She’s been a partner with her husband, and supported him. I love that she’s said up front that the kids are Priority #1 – they should be. I love Michelle Obama! She is truly my idol. As a dark-skinned, racially unambiguous black woman, Michelle shows us that real beauty doesn’t stop at a certain hue. She is an ivy-league educated lawyer whose proudest title is “mom-in-chief” to two of the most adorable little girls alive. She is the rock of the soon-to-be most powerful man on the planet. She shows us that black men like Barack can and do marry black women like her. Finally, she is proving that black women can be feminine fashion icons in their own right. My own personal affinity for the future first couple is intensified because she and Barack remind me of me and my hubby — we’re law school sweethearts. I tire of media images of black women either being Flavour of Love rejects, sexually promiscuous baby mammas, or big bad security guards that will knock you out. I am glad we finally have a real life personification of the fictitious Claire Huxtable.